Mission scientists picked Meridiani Planum as a landing site for the Mars Exploration Rover Opportunity because data from THEMIS and TES showed signs of abundant water in the region's rocks and surface materials. In choosing a landing site for the 2004 Mars Exploration Rovers Spirit and Opportunity, Mars scientists and NASA looked primarily for sites showing strong evidence of liquid water. Places where water has been abundant, scientists feel, offer the best chances of finding environments where Mars life might have once existed. In the search, scientists' attention was drawn early to Meridiani Planum. This area - once known as Sinus Meridiani and Terra Meridiani - straddles the martian equator and the planet's prime meridian: 0 degrees latitude and longitude. In 2000, the Thermal Emission Spectrometer (TES) instrument aboard the Mars Global Surveyor orbiter discovered that a mineral called gray crystalline hematite sprawls across a portion of Meridiani roughly 300 by 500 kilometers (200 by 300 miles). 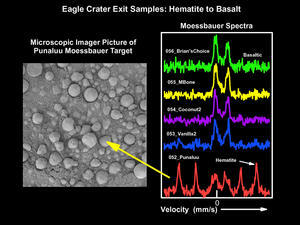 At about the same time, laser altimeter measurements from the orbiter showed the hematite region forms a mostly closed trough or depression. Hematite is an iron-oxide mineral that can precipitate when groundwater circulates through iron-rich rocks, whether at normal temperatures or in hot springs. In 2002, the Thermal Emission Imaging Spectrometer (THEMIS) on the Mars Odyssey orbiter examined Meridiani at higher resolution than TES. Working with five visual and nine infrared colors, THEMIS confirmed the hematite's presence and mapped its extent in much finer detail. For example, THEMIS' sharper view found that the hematite-rich material in the southern edge of the trough appears to have flowed into pre-existing valleys and channels. This reinforces the notion that the hematite formed in the presence of a lot of water. Besides finding a "wet" location, THEMIS also eased concerns of mission planners when it found the proposed site contained relatively few rocks and boulders. This reduced the chance of Opportunity being damaged or destroyed in landing - and it meant that mission controllers would find the driving easier. By the time Opportunity was launched in July 2003, NASA mission planners had settled on Meridiani as its target. The choice proved excellent. When Opportunity landed on January 25, 2004, it came to rest inside a 20-meter-wide (70 foot) crater, dubbed Eagle. To scientists' delight, when Opportunity opened its camera "eyes," it found itself facing a long, low outcrop of bedrock. In the weeks that followed, rover scientists explored the outcrop in detail, concluding the rock had been laid down in shallow water. The rock likely formed as briny water repeatedly flooded the site and then dried, building up layers dense with sulfate salts. 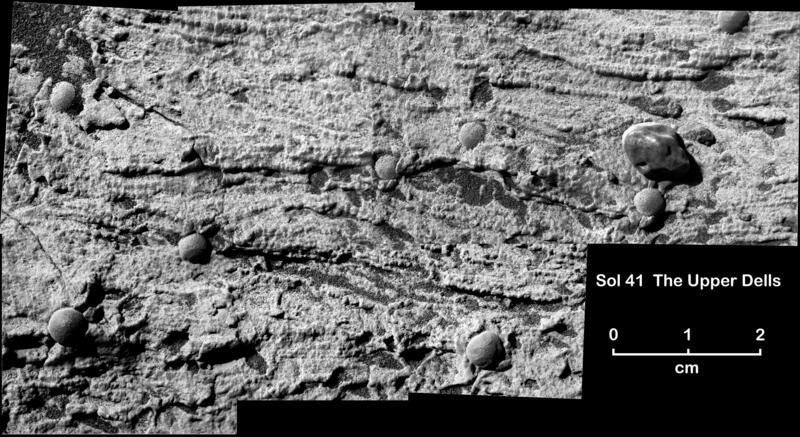 The rover findings also confirmed what TES detected from orbit; the outcrop's layers were riddled with tiny spherules rich in hematite. Only a few millimeters in diameter, these formed within the rock layers as groundwater precipitated them around impurities. On Earth, geologists call such spherules concretions. Scientists have barely begun to unfold Meridiani's geologic history. Driving down into a stadium-size crater named Endurance, Opportunity found signs that Meridiani has seen repeated wet and dry episodes, although how long each lasted is unknown. Wind-blown dunes appear to have become wet as groundwater percolated upward, raising the water table. This soaked the sediments and at times produced shallow seas or lakes. From orbit, THEMIS and TES results show that the hematite-bearing rock lies in a relatively thin layer, perhaps a few meters thick to less than 200 meters (a dozen feet to no more than about 600 feet). Rocks above and below it are poor in hematite and show little sign of water's effects. Thus it appears that while Meridiani has seen episodes of standing water and relative warmth, the big-picture backdrop is dominated by dryness and cold. Its basic mission long accomplished, Opportunity continues to make discoveries. The rover is trekking southward across the plain, as mission scientists seek to explore as much of Meridiani as the rover can reach. Christensen, P.R., and S.W. Ruff, The formation of the hematite-bearing unit in Meridiani Planum: Evidence for deposition in standing water, J. Geophys. Res., 109, E08003, doi:10.1029/2003JE002233, 2004. Christensen, P.R., S.W. Ruff, R.L. Fergason, T.D. Glotch, N. Gorelick, B.M. Jakosky, M.D. Lane, A.S. McEwen, H.Y. McSween, Jr., G.L. Mehall, K. Milam, J.E. Moersch, S.M. Pelkey, A.D. Rogers, and W.B. Wyatt, Mars Exploration Rover candidate landing sites as viewed by THEMIS, Icarus, 187, 12-43, 2005. The iron mineral hematite lies on the surface of parts of Meridiani Planum. 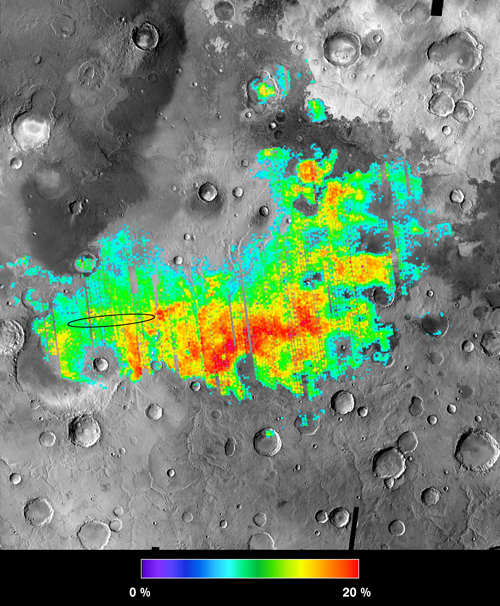 Mapped from orbit by the TES instrument on Mars Global Surveyor, hematite abundances range from 5% (blue) to 20% (red). Because hematite needs liquid water to form, its presence indicates Meridiani has seen much liquid water in the past. The background image is a THEMIS daytime infrared mosaic, and Opportunity landed within the black oval. Opportunity's Mini-TES, a portable version of the orbiting instrument, surveyed the rover's surroundings in Eagle Crater. Patches with warm tones contain hematite - up to 20% for the reddest areas. Meanwhile, blue tints indicate hematite-free basalt sand, which has blown in and accumulated on the floor of Eagle. 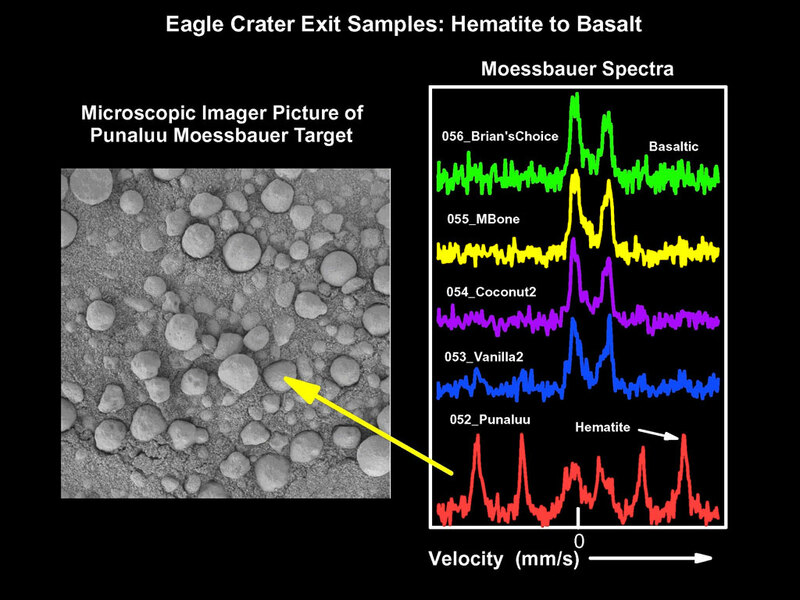 The Mini-TES instrument and the Mössbauer spectrometer on Opportunity both pinpointed where the hematite is. It resides in small spherules, each a few millimeters wide, as seen in this view of a spot called Punaluu. The spheres, nicknamed blueberries, formed as water soaked into sediments rich in a yellow-brown iron-oxide mineral called goethite. Note the hematite spectrum at bottom differs greatly from the spectrum of basalt. 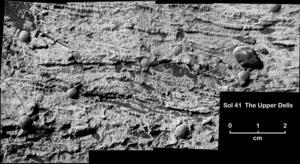 At a location on the Eagle Crater outcrop dubbed Upper Dells, Opportunity's microscopic imager shot a portrait of interweaving sediment layers. Such a pattern, called crossbedding, tells geologists that the sediments were laid down either by wind or, as here, by moving water. The image dates from the rover's 41st day on Mars. From orbit, the plains of Meridiani appear rich in hematite and for good reason. The hematite-bearing blueberries form a dense carpet, or lag deposit, on the surface. Being tougher than the rock they formed within, the berries remain after the rock eroded away. In the background of this image taken on the rover's 93rd day on Mars is the rim of Endurance Crater.